The text "Culture" cannot be translated because there is already a property called "Culture" returning the "CultureInfo". Do you need more information about this issue? Sorry that I didn't react to this question. I didn't know about this problem, but I have seen similar problems when a text corresponds exactly to a keyword in C#, like event or public. You can fix it in Multi-Language, but I admit it is non-intuitive and I don't know whether it is documented anywhere. If you go to the resources tab, you can modify the resource name by clicking in the left hand column and editing it. The change is automatically used in the source code. It would probably be a good idea if I defined a list of words which should not be used as resource names. I have added a keyword list in version 6.02.0007. 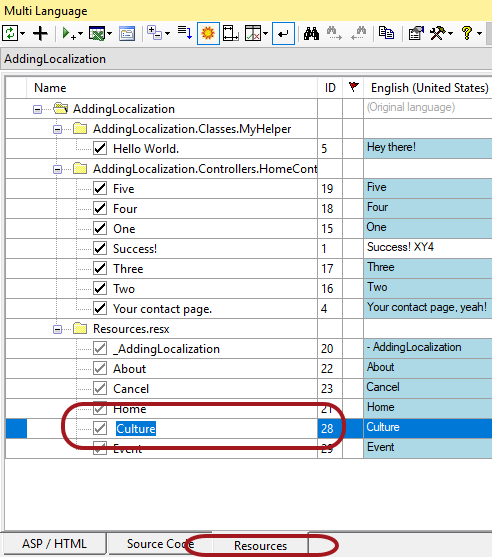 The list contains keywords from C# and VB, plus the words Culture and ResourceManager which are public members in the Resource class. If there is a conflict, Multi-Language prefixes the name with an underscore. This sounds Perfect! Thanks a lot!